Boyer peanut butter cups are a delicious combination of rich milk chocolate and creamy peanut buttery, packed tightly in a little bundle of joy that includes the classic Boyer “Play Money.” The combination of rich chocolate and creamy peanut butter is an undeniable union of greatness, and a favorite among any sweet tooth. Boyer Giant Peanut Butter Cups aren’t only giant in size, but giant in decadent chocolate-y goodness that is sure to put a smile on any face and send shivers down your taste buds. For a unique take on the classic peanut butter cup, we’ve combined the classic combination of peanut butter and chocolate, but added the deliciously sweet flavor of butterscotch to create the unparalleled and uniquely special Boyer Smoothie peanut butter cups that are a crowd pleaser and extraordinarily delicious treat. 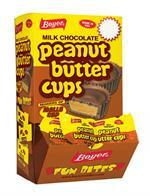 Peanut butter cups are a popular candy for children and adults, and Boyer peanut butter cups are sure to satisfy any candy aficionado. 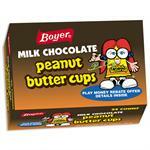 Indulge in Boyer giant peanut butter cups and more at BoyerCandies.com. 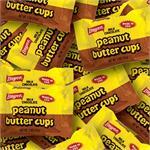 16 oz bag of assorted Mallo Cup, Peanut Butter Cup and Smoothie Cups. 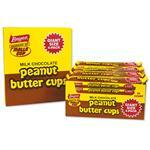 Giant Peanut Butter Cups - 24 ct.
Peanut Butter Cups - 15 lbs. 420 pieces of .5oz funsize bites. 15 pounds total. Perfect for parties, college dorms, and more! 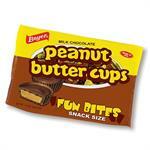 Peanut Butter Cups - 24 ct.